Forgive me for my absence. After my Advent series I’ve been scrambling for topics, throwing away most, and coming up empty handed. I make no promises that this post will be anything fantastic, because, well, I’m just running with the first idea that finally has sounded good since Christmas. I’m currently training for a marathon and as my milage has increased I’ve had the opportunity to listen to most of the Les Miserables soundtrack. Les Miserables is one of my top ten favorite books, and the broadway/film adaptation, though lacking in a few key areas, is fantastic in its own right; but the soundtrack really just reminds me of the book, and Victor Hugo’s masterful depiction of humanity, I love Hugo’s work. More on that later. In addition to long runs, I’m still–slowly–working through The Idiot, by Fyodor Dostoevsky. Though I prefer his other works, The Idiot doesn’t lack in his incredible depiction of the human psyche and spirit. In the midst of the heady reading, I’m also raising the coolest almost-nine-month-old I know, and my motives (both good and bad), selfishness and ideals are hourly revealed to me; and at each moment my own sinful nature is painfully revealed and I must surrender yet another aspect of my pride to my God, I am evermore thankful that salvation is a free gift, because there is not a single aspect of my being that could have earned it myself. So, without further distraction, here’s why you should care about what I’m reading. Both authors say everything a thousand times better then I ever will, so, stop reading my post and go read Les Miserables, The Hunchback of Notre Dame, The Brothers Karamazov, and Crime and Punishment. You won’t be sorry, I promise. But since you’re already here, I’ll tell you why those hefty volumes are more then worth your time (and even worth a re-visit if you’re already familiar). Lets begin with Hugo. Wordiness aside, the man was brilliant (and really brilliant in his wordiness since he was paid by word anyway), he understood the nature of humanity better then most. Forget all you know about Les Miserables from the movie/broadway (though it gives as good an idea as a movie/broadway can) and refer to the book. His depiction of every character displays both villain (or at least fool) and victim, he shows slavery to law, slavery to sin, and slavery to one another. Hugo favors neither rich nor poor, neither law-abiding nor thief, he reveals that all humanity has its wickedness, the poor drag others with them (listen to Lovely Ladies if you don’t believe me), the rich enslave the poor. We all step on one another to drag ourselves from, or at least to have company in the sewers, (a fantastic theme and terribly long chapter of the book). Hugo shows the turmoil within humanity with greater finesse than most literature. I say most, because Dostoevsky does it better, “Word and deed and lies and truth are all mixed up in me and are perfectly sincere (The Idiot)”. There is no greater depiction of the internal struggle of humanity, the desire to rise from filth and the inability to do so then in Dostoevsky’s books. We can relate easily to most of his characters (and at least sympathize with his most depraved), their desire to do right, to discern good and evil, and unfortunately we can also relate to their great failure, the inability not only to do good, but to even recognize it. Though Dostoevsky paints humanity very clearly, his novels (like most Russian literature) depressingly end there. 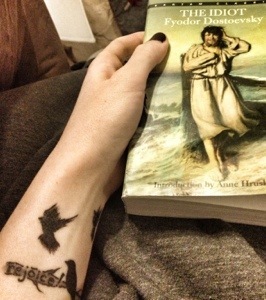 But where Dostoevsky ends Hugo begins (at least Les Miserables). Hugo displays the darkest night only to reveal the very bright morning sun that is the Gospel. He reveals God’s love, and it’s ability to not only penetrate the darkness but to expel it; to change the heart of the sinner, to change humanity. Because, though perhaps some want to, we can’t; we can’t change our natures (some may argue we can, but if this were true there would be no prostitution, slavery, murder nor war). But God can, and he did by sending his Son to be humanity, to live perfectly, to die as our substitute, and to triumph over death and sin. We are wretched beings at war within ourselves, enslaved to sin. But we have been bought, we have been rescued and we have been set free from sin, from the torment of the inward battle. It has been won by one far more capable then we, and all we need do is finally die to the wretched being who lives in the darkness, in the sewage of depravity, that we may live in the light and freedom as sons and daughters of God.